Various First buses in Huddersfield. First Halifax, Calder Valley and Huddersfield (formerly known as FirstBus Calderdale & Huddersfield) is one of the bus companies serving the area of West Yorkshire, England. It forms part of FirstGroup, a company operating transport services across the British Isles and in North America. The company operates within the area covered by Metro, a public body responsible for helping to co-ordinate public transport services in the West Yorkshire area. First Calderdale & Huddersfield is an amalgamation of First Halifax (formerly First Calderline) and First Huddersfield. The company of today originally formed part of the Yorkshire Rider company in the 1980s and 1990s, which operated most of the services in the West Yorkshire area. The company was formed in 1986 at the time of deregulation with the town suffix at the end of the name, Calderdale was Yorkshire Rider Halifax, Kirklees was Yorkshire Rider Huddersfield. Yorkshire Rider continued operation of services until 1994 when the company was purchased by Badgerline Group, who merged with Grampian Regional Transport in 1995 to form the First Group. The services were renamed Rider Halifax and Rider Huddersfield in 1995 then renamed again the same year, with Rider Halifax changed to Calderline and would also incorporate the Todmorden operation of Yorkshire Rider and Rider Huddersfield changed to Kingfisher. In 1996, the First logo started to appear on services and Calderline and Kingfisher were given their own individual livery, changing from the green and white of Yorkshire Rider. Although Kingfisher would keep green as its main colour, Calderline changed to a white and blue livery. In 1998, the First prefix was adopted to the names of the companies, with Calderline becoming First Calderline and Kingfisher becoming First Kingfisher Huddersfield before being shortened to First Huddersfield. At the turn of the century, the livery of the two companies changed to incorporate First Group's standard livery now seen on the majority of First services in the country. First Calderline renamed itself again in the 2000s as First Halifax before the decision to merge the operation of the First services in West Yorkshire to be called First West Yorkshire, which would consist of First Bradford, First Leeds and First Calderdale & Huddersfield. In 2008, First Huddersfield repainted one of their Alexander Royale's, 30843, in a commemorative livery to celebrate 125 years of buses in Huddersfield. First Calderdale & Huddersfield operates services mainly in the Calderdale and Huddersfield areas but also run services into Bradford, Leeds, Wakefield, Burnley, Rochdale, Oldham and Manchester. The services operate from depots in Halifax, Huddersfield and Todmorden, while the 184 service, which operates in the Huddersfield area, is operated from First Greater Manchester's Oldham depot. 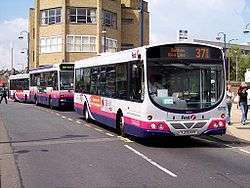 In 2009 it was reported that First along with K-Line Travel and Huddersfield Bus Company will cut services in the Huddersfield area due to the economic downturn. Services to or via: Ashenhurst, Bradford, Clayton West, Dalton, Deighton, Denby Dale, Dewsbury, Halifax, Holmfirth, Kirkheaton, Lepton, Lindley, Lowerhouses, Meltham, Newsome, Quarmby, Slaithwaite and Wakefield will be affected. In the last few years, First has introduced Overground services on services with a frequent daytime service. The Overground is now a prominent fixture on all First bus companies in the UK and is based on the London Underground network with each service having its own colour line. First Calderdale & Huddersfield have more than one Overground route with the same colour, although, to avoid confusion, the Overground is split into two sections, one for the Halifax area and one for the Huddersfield area. The 503 service forms the Orange Line in both areas. From 29 October 2006, buses running between Huddersfield and Holmfirth were re-branded as part of the HolmfirthCONNECTION. This was a service that was run in partnership with First Calderdale & Huddersfield and First TransPennine Express. It was designed to provide a direct bus to train link for passengers travelling from the Holme Valley on the bus to Huddersfield railway station to connect with trains to Leeds, Dewsbury and Manchester on TransPennine Express services. Buses 309-316 had their timetables changed and their terminus in Huddersfield moved from the bus station (buses still serve the bus station on journeys towards Holmfirth) to the railway station. The timetable changed to co-ordinate with the trains and included the introduction of a couple of late night journeys between Huddersfield and Holmfirth running after midnight. These service are currently the 314 and X11. The offer is an attractive one for people living in the Holme Valley as Holmfirth doesn't have a railway station and their connections to the trains at Huddersfield railway station is made easier as passengers are able to walk off the bus, into the railway station and onto the train without having to queue up for another ticket. This offer is that train travel is restricted to TransPennine Express services and is not valid on any Northern Rail services running along the same routes. The other is that the offer is only available for passengers travelling from the Holme Valley and is not available for people starting their journey on TransPennine Express services from Dewsbury, Leeds or Manchester. In December 2007, First made several changes to its HolmfirthCONNECTION services, withdrawing the 309, 310 and 311 services, extending the daytime 312 service and the 314 service to Holme, extending the 316 service to Parkhead and re-routing the 313 service via Thongsbridge to Holmfirth before continuing to Hepworth. Three express services were introduced, the X10 from Holme to Huddersfield, plus one journey each from the X13 from Hepworth to Huddersfield and the X11 from Parkhead to Huddersfield, both running one journey each. The changes were originally proposed for October 2007 but was delayed following complaints from local residents who were unhappy with some of the changes, especially the 313 service as Jackson Bridge would be left unserved by First. This led to a protest outside Holmfirth bus station. Following consulation with First and Metro, First agreed to provide some buses to run via Jackson Bridge and introduce some peak time express journeys. Also as some compensation, First offered free travel to all passengers of services 312, 313, 314, 315, 316, X10, X13 and X16 on its first weekday service, on 10 December 2007. HolmfirthCONNECTION services underwent further changes in April 2013 following the Holme Valley Bus Review. All HolmfirthCONNECTION services now only serve Huddersfield bus station and not the Railway station. Service 313 was withdrawn and replaced by new service 310 which runs identical to the old 313 except not serving Thongsbridge, but instead sticking to the main road (Woodhead Road) between Honley Bridge and Holmfirth. There were also changes to route 308. Instead of turning right to Holmfirth at the end of New Road, the 308 now turns left and runs past Holme Valley Hospital, right down Miry Lane (Thongsbridge), Springwood Road and then right onto New Mill Road, Station Road to Holmfirth bus station. This provides Thongsbridge with an hourly bus service to Huddersfield and Holmfirth. Routes 314 and 316 have remained unchanged. Service 312 was withdrawn which operated on evenings and Sundays which combined the 308 and 316 services. Instead service 308 now delivers an evening and Sunday service to Honley Bradshaw Road. The weekday morning peak time service X13 was withdrawn. From 27 July 2008, buses running between Huddersfield, Netherton, Marten Nest and Meltham are to be re-branded as part of the MelthamCONNECTION. It is based on the HolmfirthCONNECTION services that was introduced in 2006 to services running between the Holme Valley and Huddersfield. It is designed to provide a direct bus to rail link for passengers travelling from Meltham, Marten Nest and Netherton on the bus to Huddersfield railway station to connect with services to Leeds, Dewsbury and Manchester on TransPennine Express services. Buses 321, 323 and 324 will have their timetables changed but unlike the HolmfirthCONNECTION, their terminus in Huddersfield will stay at the bus station and not serve the railway station in Huddersfield. Passengers are able to buy tickets on the bus as normal when travelling to Huddersfield but were also able to buy tickets on the bus for their train journey as well. The tickets can be bought to be used on the day or for a week. The weekly ticket provides unlimited travel for that week on First buses in the Calderdale and Huddersfield areas and on the services from Huddersfield to Leeds, Dewsbury or Manchester. The offer is an attractive one for people living in the Meltham and Netherton areas as they don't have a railway station and their connections to the rail services at Huddersfield railway station is made easier as passengers are able to walk off the bus, into the railway station and onto the rail network without having to queue up for another ticket. ↑ "Metro - Timetable changes - Service changes for bus and rail travel". Metro. Retrieved 2 March 2011. ↑ "22 Bus Services Could Be Axed". Retrieved 25 May 2009. ↑ "Villagers angry at bus route change". Huddersfield Examiner. Retrieved 7 December 2007. ↑ "Pensioners' protest blocks bus station". Huddersfield Examiner. Retrieved 7 December 2007. ↑ "Bus firm pledges to listen to protestors". Huddersfield Examiner. Retrieved 7 December 2007. ↑ "FREE travel on Holme Valley Services". First Group. Retrieved 7 December 2007.